Y’all, I screwed up this month. It’s only like half my fault, though. My paycheck is no longer being direct deposited since I switched payroll systems a few months ago. (How patient am I supposed to be with this? I submitted the paperwork for the new direct deposit in August.) So now I grab my paycheck on the last workday of the month and use my smartphone to deposit it to our Ally checking account. But it can take several days for the money to show up in our account and become available. The mistake that I made was that I paid off our credit cards from October in the first couple days of November (using October’s money, of course) and then on November 5 we have all of our auto-transfers to our targeted savings accounts. I thought my paycheck had already been deposited so that was all good, but I guess I was wrong, and the combo of rent, our early-month bills, and the targeted savings transfers were more than Kyle’s paycheck could absorb, and I had rid our checking account of the cushion provided by the money that was slated to go to the credit cards. Anyway, we overdrafted. Ally did that annoying thing where when you have a check being deposited on the same day that some debits are coming out, they counted the debits as coming out before my paycheck going in and hit you with the overdraft. I thought you were better than that, Ally! Anyway, once I saw the $9 overdraft fee, I chatted with Ally and got the fee waived. I still honestly don’t know how I made that mistake because I did check before I paid off the credit cards that my paycheck was available – I’m 50% blaming me, 25% blaming Ally, and 25% blaming my university. But I’m glad Ally waived the fee. INCOME: Just our paychecks this month, no extra income. Internet: Our bill finally caught up with us, so we’re paying $34.99 now near the beginning of each month. Cell phones: Kyle’s usual $69.69; due to credits to my Republic Wireless account, we didn’t pay anything for my cell this month! Groceries: We were way over in groceries this month, even before our spending on our Thanksgiving dishes. Typical winter behavior, I guess! We had 12 different grocery transactions this month, which is unusually high. I didn’t stick to my normal way of eating so we probably bought more junk food than normal. Gas: Two tanks as usual for our around-town driving. Restaurants: Just two eating-out occasions this month – once to grab food before a BYOD event after church and once for a date after watching Gravity. Electricity and Gas: We spent $88.12. That’s great that it was under budget, but a little worrying because this should have been a month with very low power costs for us as the weather was very temperate. So we will probably have to keep an eye on this category. Water: Our bill this month was $37.20, so only slightly under budget. We spent $42.99 on a shelf rack for our kitchen to mitigate the tiny amount of countertop/storage space we have. Kyle bought some hooks at Home Depot for our new kitchen rack for $2.54 so we can hang some pans from the sides of the rack. We spent $562.36 out of these accounts and transferred $81.83 in above our normal savings rates. We spent $118.51 out of this account on our Thanksgiving trip to northern Virginia. That was composed of two tanks of gas, parking in garage during my 10-year high school reunion, and a meal out. We finally finished putting all our moving reimbursements and such into this account. We still have a bit of the expenses to repay but at least that will be once per month with our budget leftovers and not randomly as we receive money. We repaid this account $30.17 from our Electronics account. We paid 6 months of car insurance this month for $357.85. We saw TWO movies in theaters this month – Gravity and Ender’s Game! I think it had been about a year since the last time we saw a movie in theaters. We spent $25 on Gravity (evening movie, 3D glasses) but wised up for Ender’s Game and went to a matinee for $11. I spent $50 on a haircut. This account is perpetually in debt to our Nest Egg… We should probably fix that eventually. We repaid to our Nest Egg $30.17, which was a portion of the headphones we bought for Kyle last month. 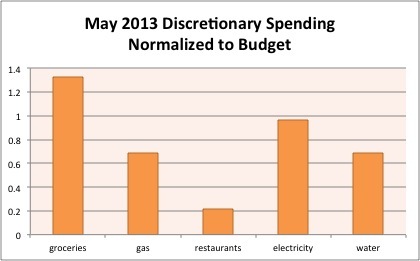 No budget changes needed this month. Bottom line: We barely squeaked in with some small budget leftovers this month. We really overspent between our groceries and the rack we bought and there wasn’t much give elsewhere to make up for it. Anyway, we had $27.54 in leftovers that we moved to our Nest Egg to repay ourselves for our move. Have you overdrafted your checking account (since you have been on top of your finances)? 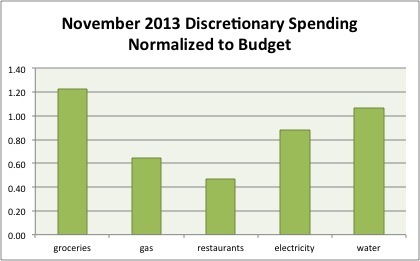 Did Thanksgiving throw off your November budget? 6 Responses to "November 2013 Month in Review: Money"
I’ve never overdrafted (we aim for big buffers in checking), but I did make the mistake once of “paying” our credit card bill out of an account that had been closed. It wasn’t too long after we had combined accounts and I had left the old account information in there instead of replacing it with the combined one… Oops! Chase was really cool about it, though. So no harm done. That’s great that Chase didn’t make a big deal out of the mistake. That post-marital financial transition can be chaotic! Don’t feel too bad about it. If it makes you feel better, I ended up missing a credit card payment on a new card, because the auto-pay function took two billing periods to take effect and when the bill was due, I was away hiking for a week. Like you, I was able to eventually get the $25 fee and interest waived, though it did take like 3 or 4 calls. I love that you’re getting free Republic Wireless service. That’s an incredible benefit of your blog. Cheers! The autopayment didn’t take for the first month?! That’s terrible! At least you got the fee waived. It just shows you that you have to stay on top of payments, even automated ones. I’ve done a couple stupid things when I’ve been on top of my finances (I had a good stint, then a bad one, and back to good again). My worst? I NSF’d my best friends wedding gift (yep…), and got hit with a $45 NSF fee. It was completely innocent – I had the money for it. In my other, other chequing account. Long story, but basically I wrote the cheque from the wrong cheque book. I was just so thankful that my best friend and I are open about finances; she just laughed it off, and I email transferred her the money from the right account. Oh, and I got my NSF fee back as a “one time good will gesture”. Alicia @ Financial Diffraction recently posted..Exciting Opportunity in the New Year. How embarrassing! Lucky it was such a good friend. I don’t care for checks and would rather do digital transfers but it’s awkward to set up sometimes.